Shop allows users to quickly create shops to buy and sell items with little effort and no commands to type! 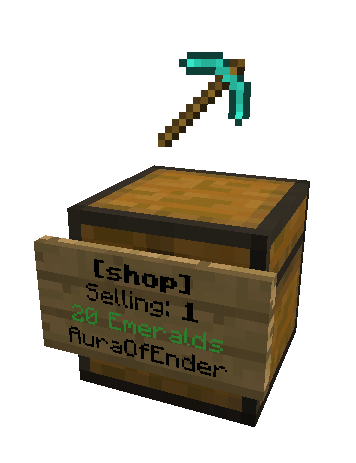 By simply placing a sign in front of a chest, players can create their own shops to buy or sell items! SHOP IS NO LONGER BEING UPDATED ON BUKKIT. Shops visually display the item they are selling. Have a question? Please read these first. /shop list - displays how many shops exist on the server. Shop is by far the easiest to use shop plugin to date and is also the most fun. People on your server will not be able to get enough! This plugin uses an auto-update system which will detect if your plugin is out of date and automatically download the latest version of the plugin. Learn how to disable this service. This plugin uses plugin metrics, which collects information and sends it to mcstats.org. You can disable this via /plugins/PluginMetrics/config.yml if you do not wish to participate in the data collection. Learn more about it here. I have put many hours of work into this plugin and it is my hope than anyone who enjoys the features it brings to their server will donate. Is there any way you or i could fix this? Thanks In Advance ! Hi SnowGear, It seems i am unable to comment on Spigot page. My server uses Java 8. It seems this plugin does not work on a java 8 servers. Can you please make this plugin compatible for Java 8. Thanks. Im loving this plugin. Hi there! I have had a issue where the item's over the chests seem to use most of the server's power.. If there's a way to remove them could you let me know? If there isen't I recommend it for some of the less beefy servers out there! Please see the Spigot page. That is where the plugin is being maintained now. Hello i really love the idea, but when i make the sign is say rupees and i dont knwo what rupees are can someone help me? So does the the "Spigot" thing up top mean you will not be updating this ever again? This is my favorite shop mod!!! Ca existe un plugin lorsque l'on fait clique droit sur un panneau il donne un lien de donnation PayPal et l'orsqu'il a donner sa donnation il lui donne l'item ? Ex:Epée diament 1€ il fais clique droit sur le panneau il clique sur le lien et donne 1€ de donnation et puit il reçoit l'item ! Why not use something like world edit and limit where the user can place signs in a world. Then users would not be able to create shops in those specific places. I have made a account and login. thats why im getting that error? i thought if i was logged in that i would be able to see it. Edit: Works now thanks. Can you pleassssseee add the world limit please. i really need to limit where player can create in what world. @Cammo009 For some reason Spigot requires users to make a Spigot account to view/purchase premium resources. Slightly annoying I know but I have no control over that. Thanks for your support though! I'm try both your links and it says SpigotMC - High Performance Minecraft - Error You do not have permission to view this page or perform this action. want to get his plugin but how can i purchase the resource if i cant find or see the plugin? New update is out everyone! I put a lot of time and work into this update and I hope you guys like it as much as I do. Unfortunately, donations have fallen very flat recently so I can't afford to offer everything for free as much as I used to. This plugin is now available as a premium resource on Spigot. If you do still want to check it out, the new video is on this page, and if you want to support me and download the plugin, it is available here. This will have to be set up on your own using Vault and the settings it offers.